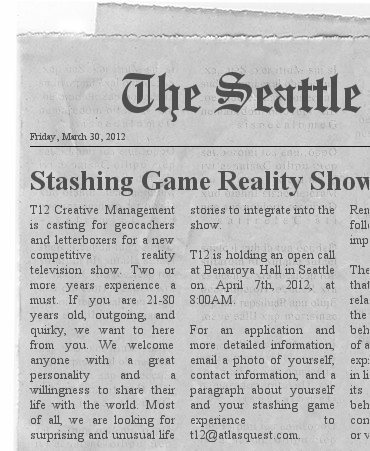 For anyone in the Seattle area this weekend, they're looking for letterboxers for a new reality TV show about stashing games! Who's game? I think we should all bring cooties to the casting call and slip them onto the folks running it. I'm carving an event stamp for the gathering! Hmmmmmn. Interesting. How did they get an AQ e-mail address without membership ("t12" doesn't show up under people search). i'd love to do this, but no way i can make it to Seattle. Are they doing casting calls anywhere else in the US? How fun! Please let us know when/where the show airs!?!? I live in the Portland area. Too bad. I would love to bring my mother to this. She's 92. My 7 year old granddaughter also goes letterboxing with us. It would be great to show the span of ages that this hobby appeals to. Real newspapers know how to spell "hear"
LOL.... I will be there!!! I think I will go down there today and wait in line so I am first. There will be a huge feature on this on the next Letterpod. I talked to the producers of the show and they really want some big letterboxers. I told them if they wanted some "famous" boxers, that they should find the "Purple Skull Guy", he would be great on this show.